Fall is here and so are summer steelhead and salmon. One thing both have in common is their love for eggs. We all know I cure my eggs in Fire Cure, but adding more scent to eggs is always important. Salmon anglers have successfully added Pautzke Red Nectar to eggs, wraps and other offerings for decades. Meanwhile, I’ve taken it a step further and combined Pautzke Nectar with other scents to create a deadly combo. This blog explains what I do to keep my clients in fish daily. No one will argue that salmon love eggs, but they love other things, too. Whether you are fishing eggs, spinners, Super Baits, rubber twitching jigs or spoons what I’ve done is experimented with ways to use two scents simultaneously and determined that employing a spray bottle was the most effective and convenient way. Using this technique will help you catch more fish. It’s easy to apply and isn’t messy. Originally, I started using spray bottles to apply scent to eggs. Anyone that’s been on my boat knows we’ve always sprayed Pautzke Nectar onto many of our baits. Meanwhile, we’ve expanded mixing and applying scents to all the baits we use this season. The stray bottle is the vehicle that makes it easy to do so. The only thing I can’t use this spray bottle method for is anything that has materials. For example, it won’t work on a marabou jig because the oils will matt the materials on it. Take the scent bottle and add two-to-four tablespoons of your favorite scent. Fill the rest of the bottles with Pautzke Red Nectar. Apply as needed. On my charters we apply every few casts. *Make sure before you apply to shake the bottle to mix your spray. You have to shake it because if it sits it will separate. *Label your different scent bottles. This enables you to use certain scents for the species you’re targeting. 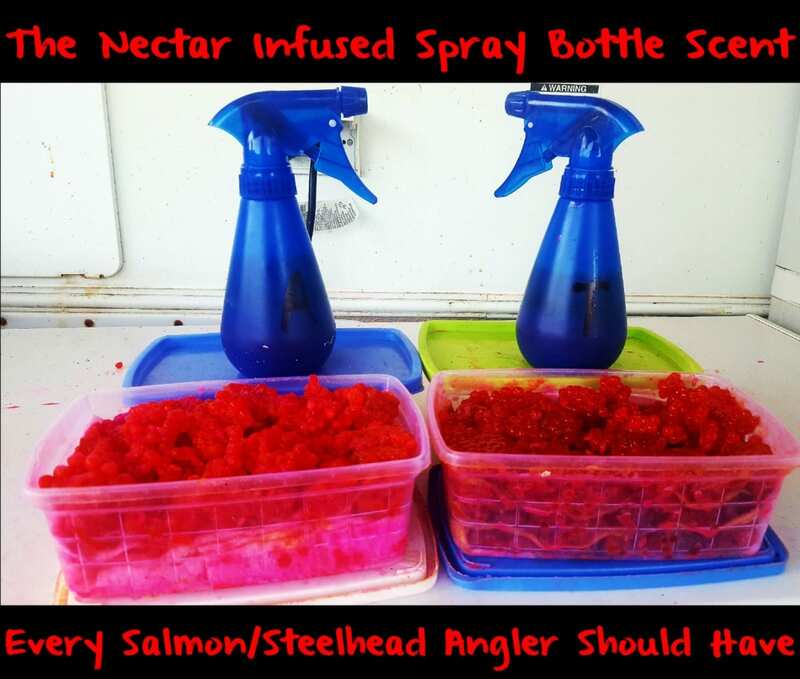 *Remember for salmon and steelhead, two scents is better than one. Editor’s Note: Veteran Pacific Northwest guide Bob Kratzer operates Angler’s Guide Service. For more information on his guided salmon and steelhead trips please visit https://www.facebook.com/Anglers-Guide-Service or http://www.anglersguideservice.com.